Sings a Tribute to Frank Sinatra. Returns from his East Coast tour, August 1st. John English, "The Voice" left Portland on April 1st to fly to Philadelphia to perform a series of gigs. For the second year in a row, he sang at the "Philly Showcase of Wine and Cheese" which benefited the Boys and Girls Clubs of Philadelphia. He had performed for the Portland Showcase of Wine and Cheese for seven years. He was also invited to perform at the Kick Off Summer celebration at the Philadelphia Airport, "Just Plane Fun". Mr. English had performed at the Portland, Oregon airport for many years, and was given a sterling recommendation by them. They are looking forward to having back to sing for them again when he returns on August 1st. John English brings Sinatra's romantic ballads and dance music to life. He says, "I don't try to be Sinatra, I try to bring Sinatra's music to life". In addition to the Sinatra material, John also sang in the Portland Opera Chorus for a season and a half. His rich baritone voice was an asset to the Opera, like Sinatra, who sang in the "Italian Bel Canto" style. John English's warm and stylish entertainment style has earned him many loyal and enthusiastic fans. 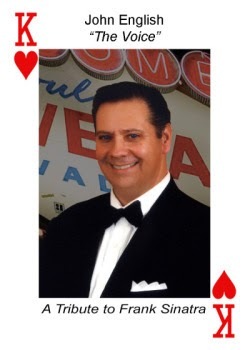 He sings over 200 of Sinatra's most popular hits, as well as all the "Rat Pack" favorites from his Las Vegas years. He has performed for numerous corporate events, festivals, clubs, anniversaries, fundraisers, weddings, casino parties, and social gatherings of all kinds.